Once again, Michael Baron has developed characters with such depth that I feel like I know them. And he has created relationships that are realistic and heartwarming. 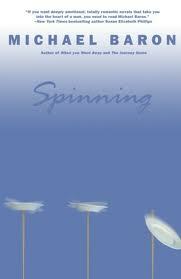 If you're looking for a touching story of love and transformation, I highly recommend Spinning. For more information and to purchase Spinning, visit Michael Baron's website. This review was written based on an e-book copy of Spinning that I received from The Story Plant in exchange for an honest review. Sounds interesting a new author to me, a name I will try to remember.